Celebrate a dazzling Christmas in the outdoors with our beautiful collection of high-quality outdoor Christmas decorations. 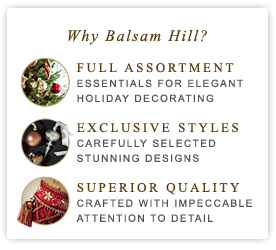 Usher in the Yuletide season by adorning your outdoor spaces with Balsam Hill's gorgeous collection of premium outdoor Christmas decorations. Designed to add the timeless elegance of the holidays to your home, our outdoor décor can easily turn your porch or patio into a charming highlight for your home.